Quinta was plodding through a successful but mundane career when she was relieved of her job. She took her newfound freedom and endless time as an opportunity to reinvent herself and rediscover joy in life. She packed her bags and embarked on a solo trip around the world. For three and a half months, she traveled to 23 countries and all 7 continents. 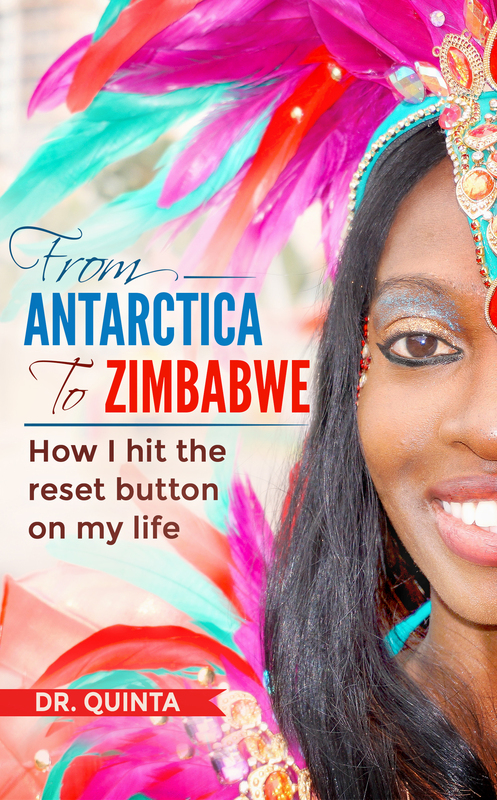 “From Antarctica to Zimbabwe: How I hit the reset button on my life” is the story of Quinta’s adventures as she made her way around the world. From camping in the Sahara Desert in Morocco, to walking cheetahs in Zambia, to surviving her ship hitting an iceberg in Antarctica, her experiences made her come alive and believe in herself again. This is a story of self-discovery and finding the courage to live the life we really want to. “From Antarctica to Zimbabwe: How I hit the reset button on my life” is available on Amazon.com, Barnes and Noble, and other retailers in both print and e-book format. Learn more about Dr.Quinta at DrQuinta.com. From Antarctica to Zimbabwe is a non-fiction travel memoir written by Dr. Quinta. Quinta’s life had followed the professional career track expected by a child of Nigerian educators. She successfully pursued a doctorate in chemical engineering and was offered a career position in the petrochemical industry, following her success with the hiring company during her internship while in school. While she excelled at her job and took advantage of her vacation time to indulge her wanderlust, she knew something was lacking in her life. There was no spark, no excitement in her professional existence. Plus, there was the stress arising out of her knowledge that layoffs were coming, and that she would, at some point in the near future, be out of work. She had debated applying for another position in that field, but instead took her mentor’s advice to heart and waited for that layoff notice to arrive. When it did, she was struck by the feeling of freedom she was experiencing. It was, indeed, the first time that she was not under an obligation, either to her studies at school or her responsibilities at work. Her husband urged her to travel and take some time for herself, and that’s exactly what she did. Quinta mapped out a 23-country, 7-continent adventure that would keep her on the road for over three months. It was every bit the adventure she had hoped it would be, and it proved to be a life-changing experience. Dr. Quinta’s non-fiction travel memoir, From Antarctica to Zimbabwe, is very likely the next best thing to actually taking that incredible globe-trekking journey for yourself. While most of us dream in terms of Jules Verne’s classic novel, Around the World in Eighty Days, Quinta, who loved reading that book as she was growing up, actually lived it. I marveled at the way she used her academically honed discipline to scientifically chart a successful, relatively affordable world tour, while leaving ample room for spontaneity and the occasional flirtation with serendipitous opportunities. The author is the consummate guide to each of the locations, which she describes in some detail in this memoir. She’s lavish with her appreciation for the cultures, kindness, and the scenic beauty of the places she visits, and she pulls no punches when discussing disappointments with food, service, or even a long-term friend who turned out to be a less-than-pleasant travelling companion. Quinta shares her experiences at each major stop on her trip and concludes each section with handy Tips for Travelers. I’m particularly interested in travel memoirs about the polar regions and was most impressed with her Antarctic section and the photographs she includes from that part of her trip. I also loved her accounts of her desert adventures, especially her experiences with the sand dunes. Quinta’s photography, which is first-rate, works quite well with her eloquent and flowing narrative, making this travel memoir a truly memorable and inspirational armchair adventure. Wondering where in the world you’d like to visit sometime? From Antarctica to Zimbabwe gives the aspiring tourist a host of attractive options to consider. From Antarctica to Zimbabwe is most highly recommended.